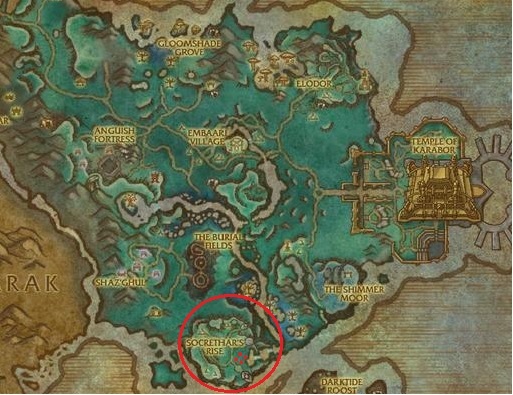 The pathway up to Socrethar's Rise starts at 44.89, 70.10 in Shadowmoon Valley. For those without coordinates: Socrethar's Rise is accessible from a stairway directly north of the letter "C" in Socrethar's Rise on your in-game map where you see the cliff-face's edge. and Draenic Gems, which gives you a bonus multistrike chance of 20%. - Trabalhador Sargerei gives 1% credit. - Iniciada Sargerei gives 1% credit. - Acólito Sargerei gives 1% credit. - Laminegra Sargerei gives 3% credit. - Lordemônio Sargerei gives 7% credit. - Destroying a portal gives 5% credit. link shows 4 red dots inside the red circle, that is where the demon portals spawn. Was heavily farmed on frostmourne and they respawn about every 2-4 mins. They give alot of process on the progress bar and is alot faster than killing mobs. Destroying the Demonic Portals scattered around the camp give 5%. If destroyed while disguised, you will lose your disguise and have to deal with the two Binders beside the portal. Location: Take the stairs from 44.89, 70.10 up to the plateau. For Horde, continuing on the road from eastern Talador will take you into Shadowmoon Valley. Or, take Caminhante das Águas Lazúli from the coast of Spires of Arak along the southern coast of Shadowmoon Valley. This is one of the more straightforward quests—-kill different types of mobs for progression based on their health/difficulty. Minibosses give the most progress at 25% each. There are several objects that provide buffs in the area, such as Óleo de Umbralâmina, Essência Destilada, Pó de Gema. Demidos can drop Serviçal de Dêmidos. 1-st kill gives you Um verdadeiro Demidos achievement. Assault invasion: Invasão dos Lua Negra! If you lose your disguise you'll also lose the quest givers. You'll then need to go searching for the pieces of the disguise again. Compared to the other 3 garrison 'Assault' missions this can take a little longer. If you are going solo, beware the Demonlords; they have a lot of HP & the time it takes to bring one down can mean that other mobs join in to beat you up. For some reason my disguise only worked on the first 'run' when the assault was a bonus objective alongside a series of quests. I've made a video explaining everything you need to know in order to complete the assault quest, while also getting the relevant achievements: Um verdadeiro Demidos, As pedras no caminho & Tire Tudo Deles. As always, no BS just the info you need to get the job done! 1) If you fight anyone while in disguise, you will destroy your disguise and have to re-kill people to recreate one. 2) If you simply right-click the buff on the top when you want to fight someone, then you don't destroy your disguise. It goes right back into your bag so you can wear it again. I wish I knew this earlier! Ataque as forças Sargerei no Elevado de Socrethar, que fica no Vale da Lua Negra. Relatórios recentes sugerem um aumento notável na atividade das forças Sargerei no Elevado de Socrethar, ao sul do Vale da Lua Negra. Os discípulos de Socrethar representam uma ameaça aos draeneis e à nossa guarnição. Temos que dar cabo neles assim que possível.